A playfully brilliant re-creation of one of the most-loved detective stories of all time—the companion book no Holmes fan should be without. Eliminate the impossible, Sherlock Holmes said, and whatever is left must be the solution. But, as Pierre Bayard finds in this dazzling reinvestigation of The Hound of the Baskervilles, sometimes the master missed his mark. 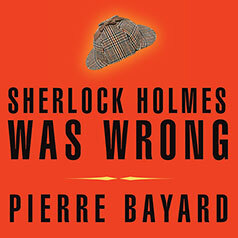 Using the last thoughts of the murder victim as his key, Bayard unravels the case, leading the reader to the astonishing conclusion that Holmes—and, in fact, Arthur Conan Doyle—got things all wrong: The killer is not at all who they said it was. Part intellectual entertainment, part love letter to crime novels, and part crime novel in itself, Sherlock Holmes Was Wrong turns one of our most beloved stories delightfully on its head. Examining the many facets of the case and illuminating the bizarre interstices between Doyle's fiction and the real world, Bayard demonstrates a whole new way of reading mysteries: a kind of "detective criticism" that allows readers to outsmart not only the criminals in the stories we love but also the heroes—and sometimes even the writers.